Top Boat Trips Puerto Pollensa - Book here for Best Value! 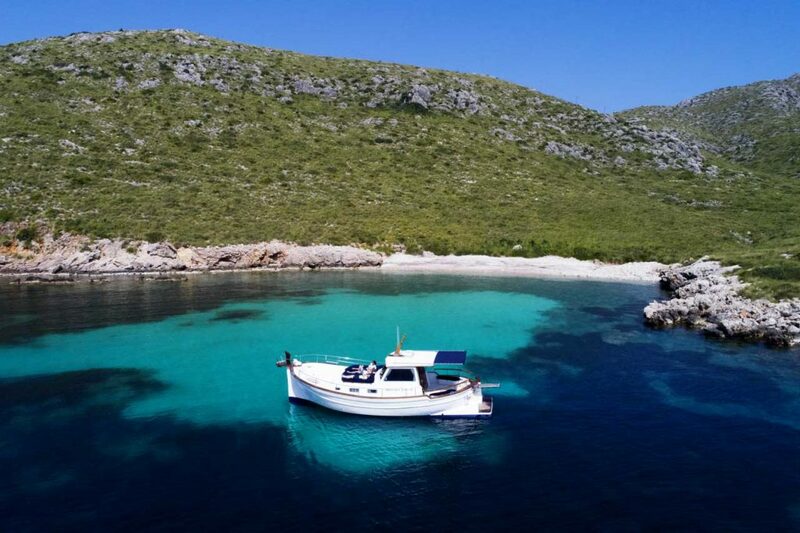 A boat trip from Puerto Pollensa along Mallorca’s stunning north coast is an amazing experience and will leave you with many beautiful, lasting memories. These popular boat tours get booked out quickly, therefore it is a good idea to reserve a place! While away your time on board a luxurious Llaüt boat in the turquoise waters of Pollensa bay and beyond . This beautiful traditional yacht is 13 metres long, with a maximum capacity of 12 passengers. Relax and unwind on the large sun-deck and admire the picturesque and stunning views of the coast and the Tramuntana mountain range. Enjoy mouth-watering snacks, delicious fruit and cold drinks in the spacious stern, which is equipped with a table and comfortable benches. Cool off, swim and snorkel in the crystal-clear waters of the Mediterranean. To find out more, please contact us with your question or booking enquiry. Depending on how much time you want to spend on board, you can choose between a morning or afternoon half day boat trip, a full-day outing or, for an especially romantic experience, a sunset-tour. You may visit secluded little coves like Cala Murta or Cala en Gossalba, which are difficult to reach by car and stop off at stunning beaches like Formentor or Cala San Vicente, where you may have time to go for lunch. You have the option of booking on a shared boat tour, however, if you would rather enjoy the experience in the privacy of your family or group of friends, the boat is also available for private charter.  How about wine tasting or a special meal on board?  Do you have something to celebrate? Birthday parties, stag or hen dos and other celebrations can be catered for.  You want an especially relaxing time on board? Why not add yoga or massage therapy to the experience?  You like to be active and adventurous? Then maybe exploring some otherwise inaccessible places by paddle board is for you.  And of course your transfers to and from the boat can also be arranged, if needed. Children from 3 to 6 years get a 10% discount. Contact us to find out more or to reserve a place. 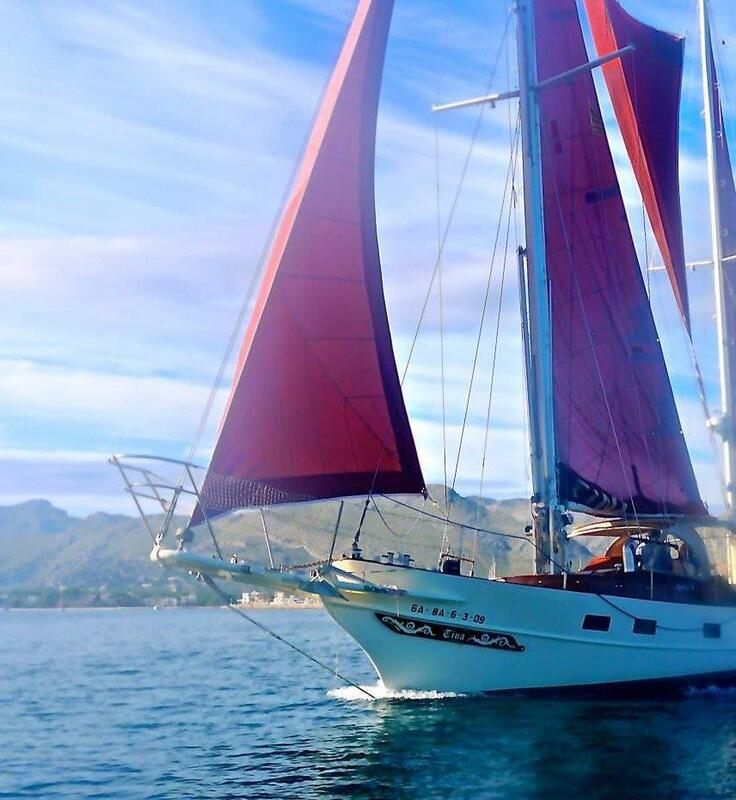 If you like sailing, then a trip on this amazing yacht in Puerto Pollensa is an absolute must on your holiday! 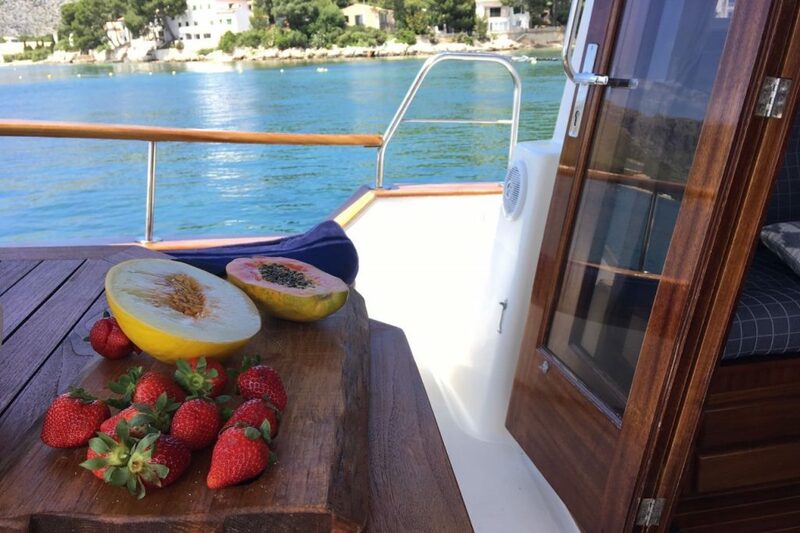 Enjoy a fun day out on this classic sailing yacht, which offers large sun decks to relax and soak up the rays, a big cockpit area to provide shelter from the mid-day sun and Bluetooth speakers that allow you to play your own music while on board. As a unique feature, this yacht is also equipped with a diving board, which provides endless fun! 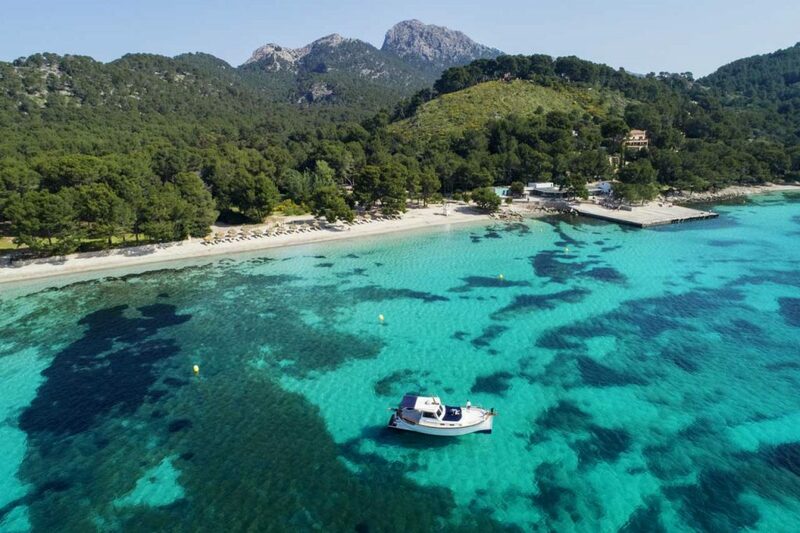 The trip will take you across the picturesque bay of Pollensa and will stop off in one or several of the many littles coves and beautiful beaches which can be found along Mallorca’s North Coast. There will be time to swim, snorkel and paddle board and of course, to dive into the crystal-clear water from the diving board. Depending on the duration of your outing, you will be offered snacks, tapas or a full lunch together with chilled local wine or a glass of cava. 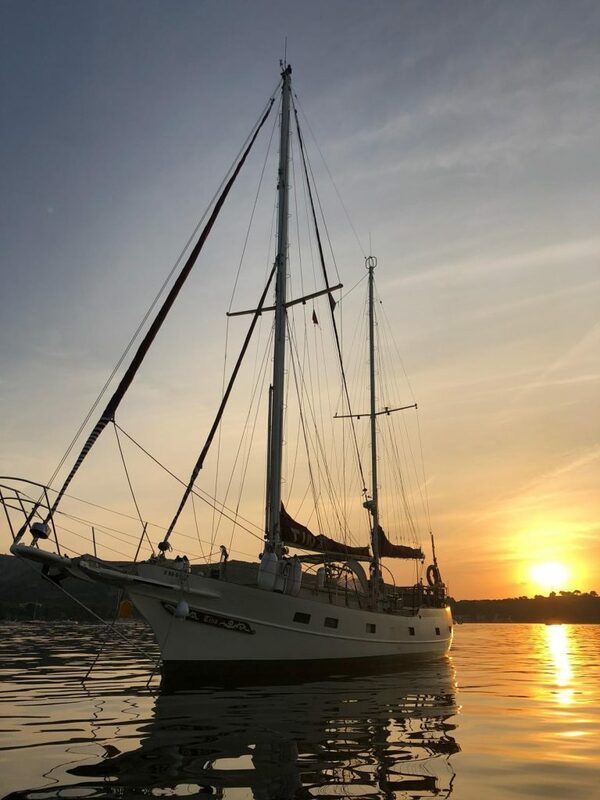 You have the option of a half day yacht tour or a a full day out at sea or, for an unforgettable experience of watching the sunset out at sea, you can take part on one of the popular sunset tours. All of the options are available as shared trips or as a private charter.  The sunset trip can include a BBQ at an additional cost of €15 per person (minimum 6 people).